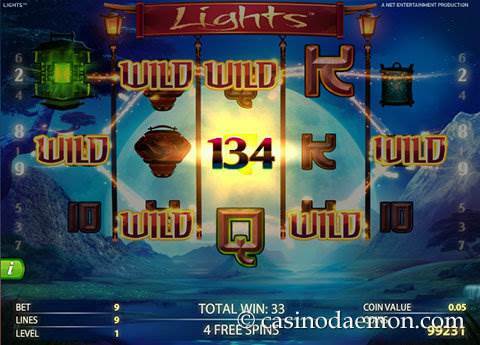 The slot game Lights by Net Entertainment is an exciting game with a pleasant atmosphere and soothing background music. The background image is an Asian landscape with mountains and lakes. The game gets its name from the shiny lantern symbols, that illuminate the night. In this game you get at least 2 wild symbols with each spin, and you can win up to 30 free spins. You can also win up to 90.000 coins with just a single spin. The many wild symbols will create frequent winning combinations, which means that the slot has a relatively low variance. The game can be played for a few spins or for a longer session. Most money can be won in the free spins though, as you have even more wilds then. 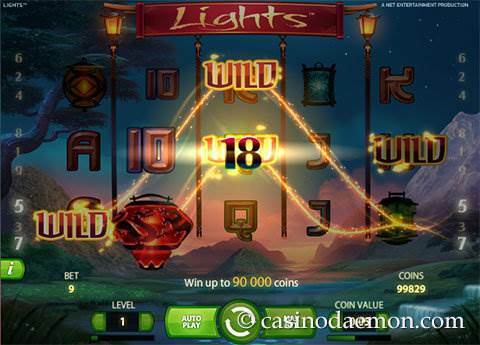 You can also play the Lights slots on mobile iOS and Android devices. The slot has been optimised for mobile play amd is part of the Netent Touch slot series. Are you stressed? Maybe playing a round of Lights slot for free will help? 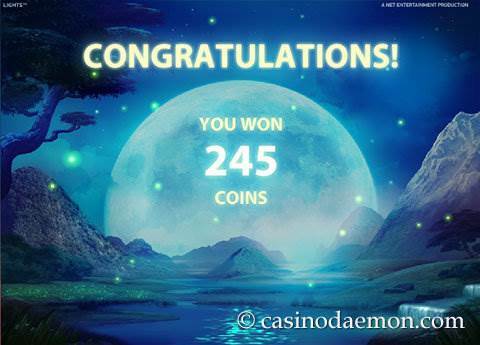 You can try out this soothing game without obligation, but if you are looking for the real fun you can play it for real money at one of the casinos you can find on this page. In every spin you will see fireflies swarming around the reels. They will transform between 2-4 symbols randomly into wilds. These wilds substitute all symbols, except the scatter, to form winning combinations. The scatter awards you with free spins. Three, four or five scatters give you 10, 20 or 30 free spins. You can also win additional free spins in these rounds. In the free spins you will get 3-6 of the floating wild symbols. The highest paying symbol is a red lantern, and you get 1000 coins when you manage to get 5 of these symbols on a pay line. The amount is then multiplied according to the bet level. 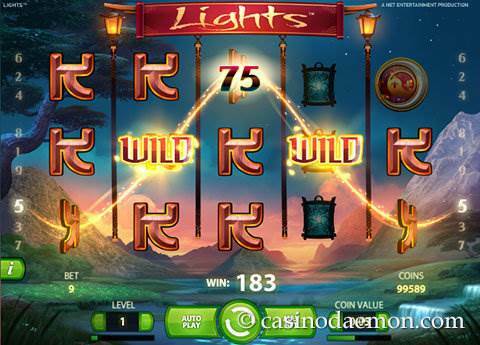 The slot game Lights is a 5-reel slot with 9 pay lines. In this slot you can pick a coin value of between 0.01 £/€/$ and 1 £/€/$, and you can select up to 10 bet levels. The minimum wager is 0.09 £/€/$ and the maximum that can be wagered in a single spin is 90 £/€/$. Clicking on bet max plays all 10 bet levels with the selected coin value. The Netent slot game also features auto play options with advanced setting options.